Some time ago, I saw a news report on comments made by Nobel laureate Elie Wiesel about Ponzi schemer Bernie Madoff. Wiesel admitted that he fell totally for Madoff’s charm some 20 years ago and, as a result, invested (and lost) some 15 million dollars on behalf of his Elie Wiesel Foundation for Humanity. In his comments about Madoff, reported by the New York Post, Wiesel said, "Psychopath is too nice a word for him." Wiesel went on, "He [Madoff] should be put in a solitary cell with a screen and on the screen, for at least five years of his life, (there would be) pictures of his victims." Strong words, indeed. Given that Madoff was recently sentenced to something like 150 years in prison, I reckon Wiesel got most of his wish. I have no interest in even trying to defend Bernie Madoff, but it strikes me as ironic that people are ready to tar and feather him for doing something the U.S. Gubmint has been doing since about 1935. I wonder, "Why would this guy Madoff, who jilted people via a voluntary choice, be more worthy of condemnation than American Presidents, who routinely kill, enslave, and steal from people using coercion and the threat of violence?" Seriously, if Madoff deserves to be imprisoned and tortured, certainly someone who kills a family he's never met soon after his first day in office deserves similar punishment, no? Interestingly, I'm not the only person who wonders about this aloud, nor is every advocate of freedom in agreement on the issues. I rather think the Madoff case illustrates why libertarian restitution, applied outside the realm of security and patrol, is a best-case solution, but that is for another essay. In many cases, among both the intelligentsia and the proletariat, whenever the discussion turns to politics, people display a partisan bias. In response to a few of my essays, respondents have even accused me of being a partisan. (No one ever said reading comprehension was a prerequisite for sending a random e-mail to some guy you found on the Internet.) As a market anarchist, I take no stock in any political party, mainstream or otherwise. I've stated as much more than a few times, starting with my very first essay ever, and continuing up through my "Is It Wrong If I Just Don't Care?" rant, and beyond. For the mathematically inclined, if you take the first derivative of the data presented to find the slope of each President's debt increase, you will find that the Republican slopes are consistently more positive than the Democratic slopes. For everyone else, this just means that unbiased mathematical proof exists to support the claim that since 1945, Republican presidents have borrowed more than Democratic presidents regardless of the inflation rate. Jackson did not believe in debt, or banks for that matter, and he made a real effort to eliminate all federal debt. He got it down to $18,000 (or somewhere thereabouts) just before leaving office. So "Old Hickory" was none too fond of debt. He also wasn't that much of a champion of freedom, given his stances on nullification — secession — and the forceful removal of Indians. (I admit it. I'm still a little shaky on how one can "discover" land with people already living on it.) Jackson's specific foibles aside, if holders of the highest office in a land supposedly founded upon the ideals of freedom do not exemplify a belief in freedom, it pretty much means that the late, great Harry Brown was right when he said, "Government doesn't work." 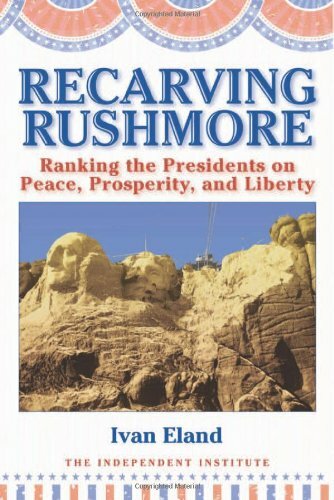 Author Ivan Eland, of the Independent Institute, has written a book entitled "Recarving Rushmore" which examines each U.S. president vis-à-vis the level of success each had in advancing the causes of peace, prosperity, and liberty. I certainly won't duplicate Eland's excellent scholarship in this essay, but this essay represents my own attempt to analyze selected presidents spanning the entire history of the presidency in the U.S. using a similar rubric. 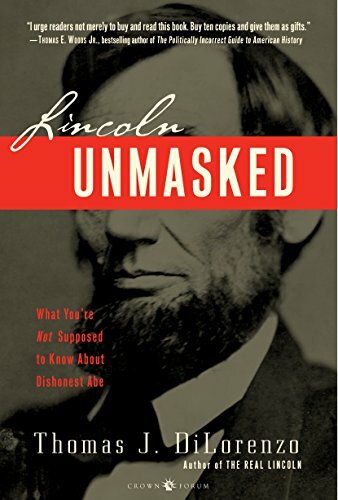 As an aside, based upon a wonderful long-format interview I was lucky enough to see, Eland rates John Tyler, Grover Cleveland, Martin Van Buren, Rutherford B. Hayes, and Chester A. Arthur as the best presidents of the U.S., due to their stances and accomplishments in maintaining a limited government, operating via a restrained executive branch and maintaining a restrained foreign policy. Note: My sincere thanks to posters at the FreedomainRadio.com Forums for their help on this table. Quelled the Whiskey Rebellion via armed troops. Signed the Alien and Sedition Act. Won the presidency directly by virtue of owning a lot of slaves. Imposed draconian embargo and enforced it via martial law. Prosecuted more people under the Alien and Sedition Act than John Adams. Notes: The first three presidents of the United States of America infringed upon their "subjects" in ways that were antithetical to the powerful words of document(s) they actually conceived and signed. A revolutionary leader like John Adams somehow decides that it makes sense to jail people for speaking out? Come on. Jefferson, who Eland rightfully calls "a towering intellect," jailed more people with the Alien and Sedition Act — a piece of legislation he did not originally support — than did Adams. Authorized military conscription, while authorizing the rich to avoid draft via cash payments. Sent troops into NY City to enforce the draft. Authorized the printing of 1st U.S. fiat currency. Effectively removed secession as a relevant possibility via the Civil War. Authorized the creation of the Federal Reserve. Authorized the U.S. entry into WWI. Signed the Internal Revenue Act, which led to the modern personal income tax. Mobilized the U.S. economy for wartime, leading to the Military-Industrial Complex. Spearheaded the creation of the League of Nations via actions that eventually led to the rise of the Bolsheviks in Russia. Notes: For a president who does not seem to get a lot of mention, Wilson seems to have set the table for an alarming loss of future freedom. The creation of the Federal Reserve alone deserves its own essay. Spearheaded economic policies that led to the Great Depression. Established The New Deal social programs. Authorized the U.S. entry into WWII. Authorized the bombing of Dresden. Set up Japanese internment camps in the U.S. Created the Tennessee Valley Authority, which led to nationalization of utilities. Authorized the atomic bombing of Hiroshima and Nagasake. Authorized the formation of the National Security Agency (NSA). Signed the War Powers Act which led to the formation of the War Finance Corporation, and later the Small Business Administration (SBA). Notes: FDR and Truman seem to get a lot of positive spin from those who ascribe to a liberal point of view. Given that the Great Society hurt poor people more than any single presidential act that seems rather misguided. In contrast, the acts of murder from the dropping of the atomic bomb cannot be misinterpreted. Started the war on (some) drugs. Continued CIA intervention in Chile's internal affairs. Continued interventions in Cambodia and Vietnam. Notes: Few bad decisions have had a more sweeping negative financial effect than the removal of the gold standard, although other decisions made around 1980 do seem to have really gotten the ball really rolling. Instituted gasoline price controls, leading to a massive gasoline shortage. Authorized funding of the Mujahedeen. Signed the Foreign Intelligence Surveillance Act (FISA). Signed the Community Reinvestment Act (CRA). Promoted economic policies that deepened the chasm between ends of the socio-economic spectrum. Increased funding of the Mujahedeen. Contravened the Boland Amendment by laundering money from the sale of arms to fund his own private war — the Iran Contra Scandal. Doubled the size of the U.S. Federal Government. Got into bed with Osama bin Laden. Deepened U.S. involvement with Osama bin Laden. Further increased the size of the U.S. Federal Government. Authorized the Battle of Mogudishu. Authorized the invasion of Afghanistan. Committed a plethora of impeachable crimes. Whole treatises could be written about the follies launched into history by George II. The guy generated his own impeach-Bush movement. Giving such a monumentally un-gifted man a larger entry seems wrong though. It also seems, if his First 100 Days are any indication, that Bush the Second's successor, President Barack, might enter into an almost Reaganesque realm with his combination of spending and contributions to liberty such as indefinite detention. I'll leave enhancing the entries of Clinton and Bush II, as well as creating an entry for President Barack as an exercise for the reader. The bolded items in my table represent broad categories whose ramifications resonate today. The Federal Reserve deserves its own essay. For a wonderful, if troubling study of this subject, I endorse G. Edward Griffin's "The Creature from Jekyll Island" heartily. For now, this simplistic explanation should suffice. The Federal Reserve is not that much more "federal" than Federal Express. It is simply a quasi-private central bank, run primarily by a presidentially-appointed board of governors. According to Wiki, a central bank has as its primary responsibilities: to maintain the stability of the national currency and money supply, with more active duties including controlling subsidized-loan interest rates, and acting as a lender of last resort to the banking sector during times of financial crisis (private banks often being integral to the national financial system). Given that the U.S. dollar has lost well over 90% of its value due to the inflation that is an inexorable result of central banking, I'd say stability has not been achieved. Wealth transfer, well, that has been achieved! Governments exist to make war. They always have. This is because war is a racket. Standing armies, which are remarkably misnamed, are the realization of the fact that without professional soldiers, wars are often quick and indecisive or long and ridiculous. (That is, states can still fight, but it's not really that, well, satisfying and the wars can fizzle out due to simple logistics like running out of ammo or food, or having to tend the crops.) With professional soldiers employed by a highly-developed state, the cost of supplying them, feeding them, and housing them can be off-loaded to others. This makes it possible to invade and conquer distant lands and make “efficient” war, i.e., kill a lot of people very quickly. Best of all, the profits can still be absorbed by the war-racketeers. That sums it up. The war racketeers have been milking the U.S. cow for years. If the supposedly-omnipotent moral busybodies would simply mind their own business, we'd all be happier. We would also slow the apparently inexorable movement toward becoming a nation of criminals. Given what one can see in my (admittedly incomplete) table, it seems pretty clear that U.S. presidents are not really champions of freedom and liberty. Since they occupy the highest office in the land — a position of power in the coercive state — this should come as no surprise. What is more troubling is the continued persistent belief that the next guy (or gal) elected to the position will somehow transcend the forty-plus year history of mediocrity, lying, infringements upon freedom, state-authorized theft, and murder of any foreign person with the gall to actually not like it when we show up with guns to teach them all about democracy. I've heard it said that quitters never win and winners never quit, but never winning while never quitting seems rather stupid.